Sheikh Jamal Dhanmondi Club reached the semifinals of the Walton Federation Cup Football Tournament after a 2-1 win against Saif Sporting Club in the second quarterfinal at Bangabandhu National Stadium on Friday. Sk Jamal will play the first semifinal against current champions Dhaka Abahani at the same venue on November 21. 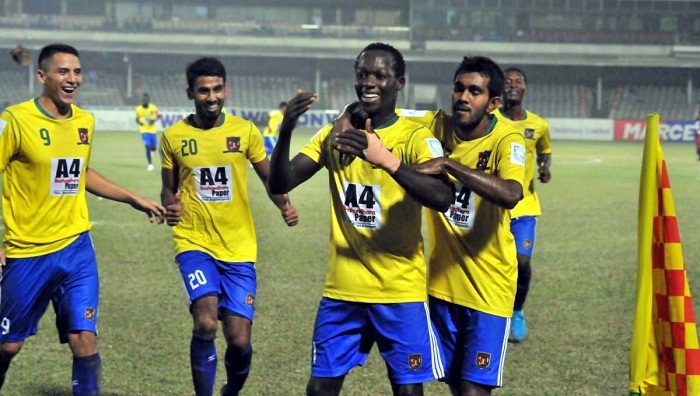 The most title winners -10 times – Dhaka Abahani - confirmed their semifinal berth thrashing Arambagh Krira Sangha by 3-2 goals on Wednesday last. In the day’s match, Sainev Bojang scored both the goals for the winners firing the net once in each half. S Bojang put Sk Jamal ahead in the 29th minute while the losing side only scorer Deiner Andres Cordoba levelled the margin in the 71st minute before S Bojang found the net for the second one in the 76th minute to confirm the victory.